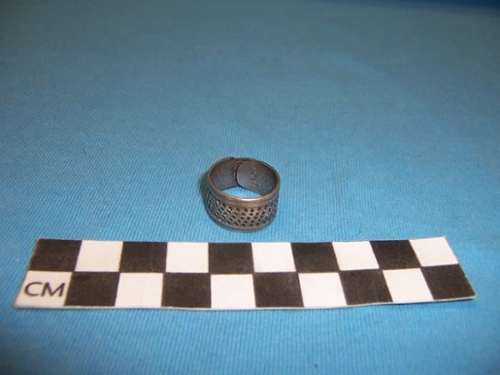 Archaeologists discover fragments of all these styles at sites in Montana and elsewhere in the United States, Canada, Australia, and New Zealand. Unless otherwise noted, all items on this page are in the private collection of Gary Weisz. In addition, all photos on this page are by Gary Weisz. Chinese brass buttons purchased from Beijing, China. 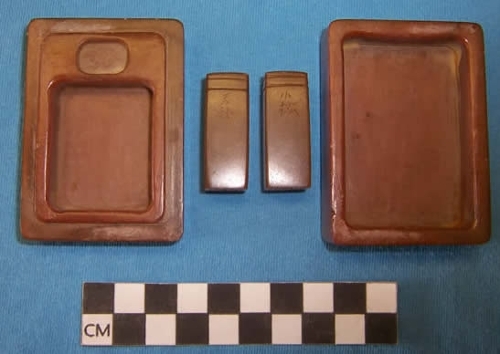 Chinese brass buttons of the type commonly found on United States archaeological sites. Purchased from Beijing, China. Silver Chinese buttons purchased from Beijing, China. Metal bade or pin-back button from a Chinese restaurant. Back is stamped "P.C. STAMP WKS SEATTLE" or Pacific Coast Stamp Works. Pacific Coast Stamp Works began operations in Seattle in 1903 and operates today under the name Mastermark. Chinese brass buttons purchased from Beijing, China Note the raised relief endless knot, which is a sign of longevity. Chinese glass buttons purchased from Beijing, China. Chinese cobalt glass beads, starbust pattern from Shanghai, China. Brass Chinese padlock, ca. late 19th Century from Beijing China. 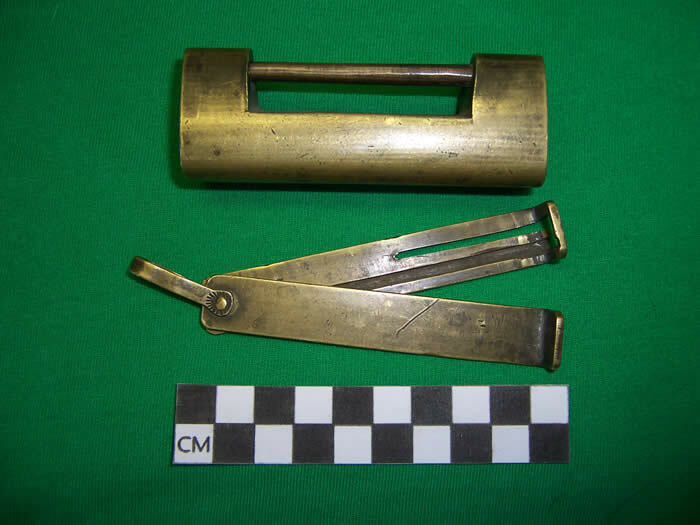 Photo on left shows brass lock as closed with splitting key. 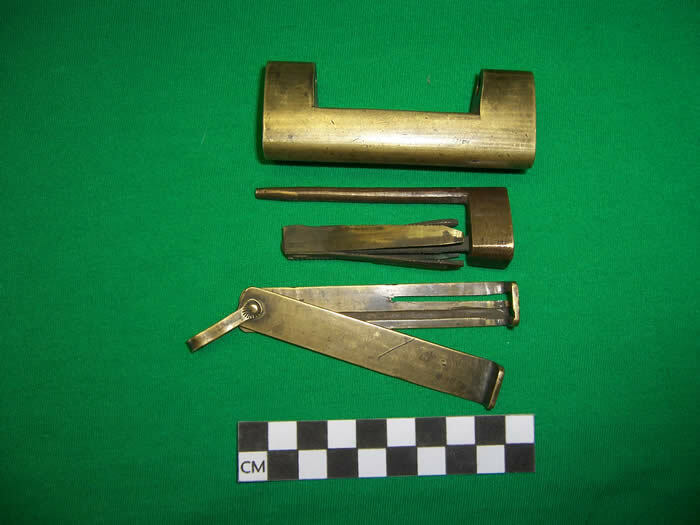 Photo on right shows disassembled lock with (top to bottom) lock body, sliding bolt and splitting springs, and the brass key. 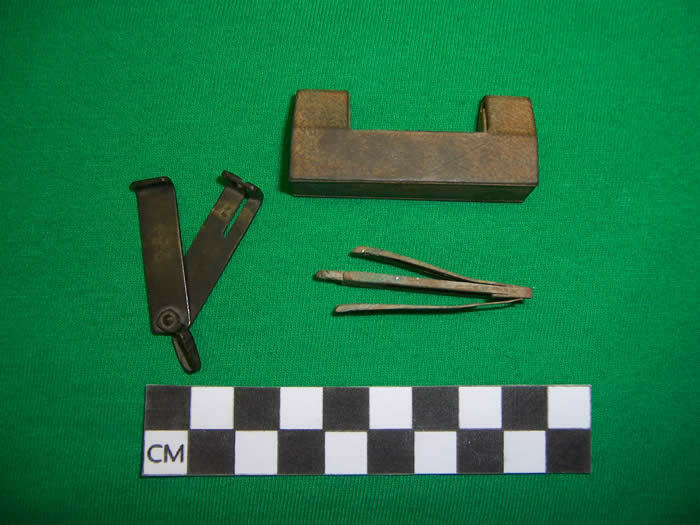 Brass Chinese lock with splitting springs as found at Chinese archaeological site in Idaho. Splitting key on left came from Chinese site in Montana. 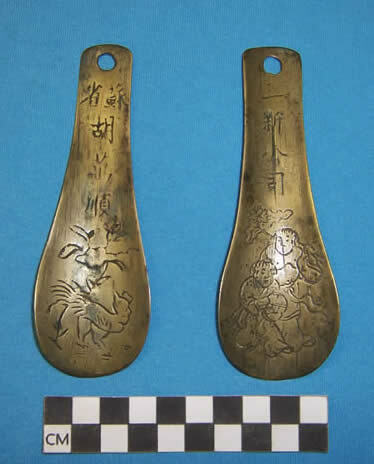 Chinese brass locks with keys. 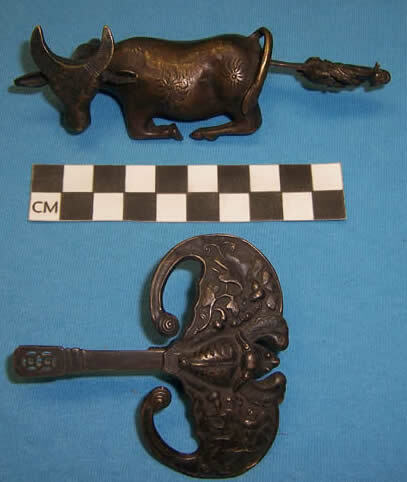 Ox motif lock at top from Nanning, China. 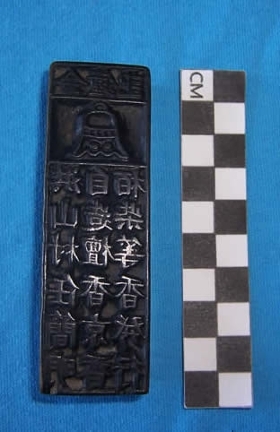 Bat motif lock at bottom from Shanghai, China. Chinese bone dice, purchased from New York. 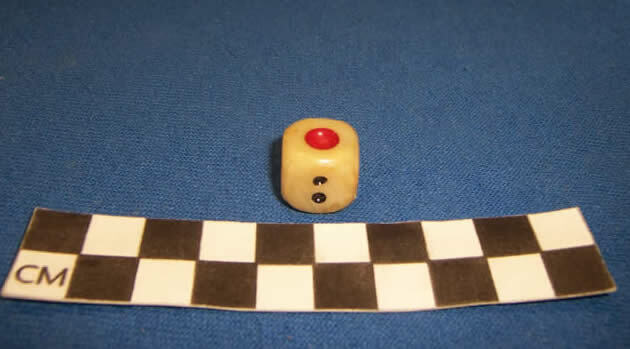 Similar dice found at Los Angeles Chinatown excavations. Metal wok spatula with Chinese lettering, purchased from Wisconsin. 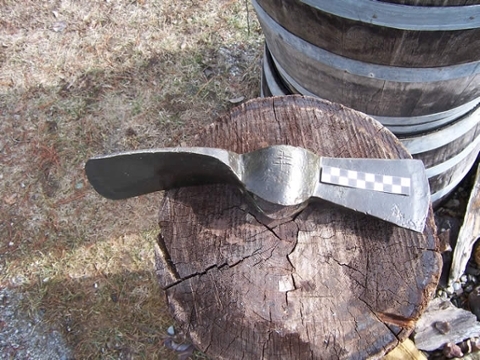 Similar spatula found in Tucson Arizona Chinatown and at German Gulch excavations in Montana. Chinese brass scales purchased from Oregon. Wood Chinese needle-puller purchased from Beijing, China. 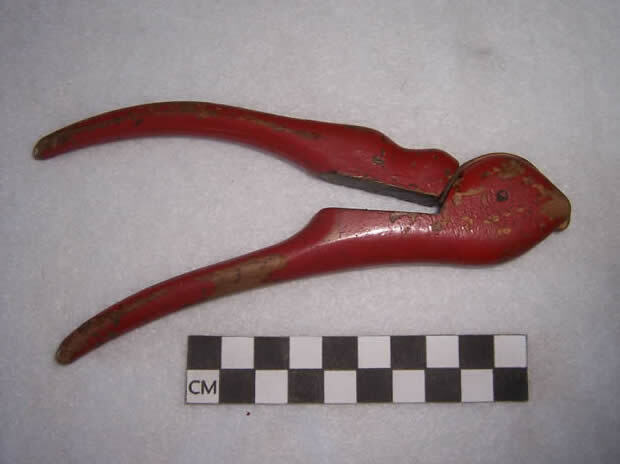 Chinese metal tweezers from Beijing, China. 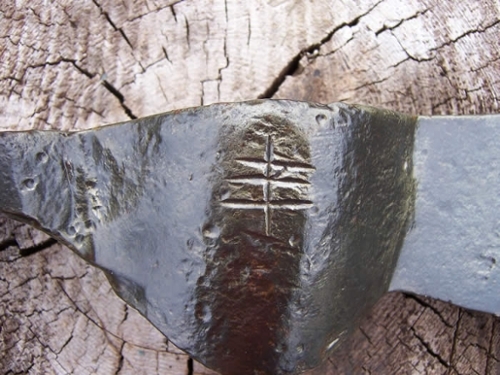 Incised Chinese character cut into a mattock found buried atop the 1882 Northern Pacific Railroad 600 feet long rock cut at Cabinet, Idaho. This character was translated as probably being "abundant", but could also be the Chinese surname "Feng". 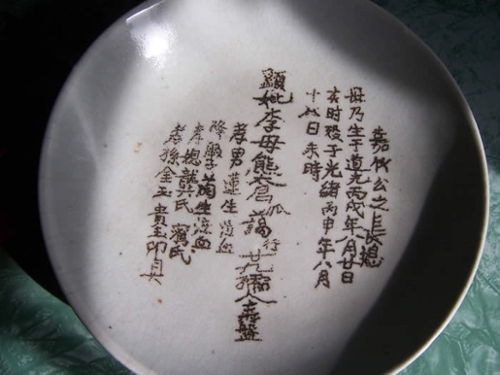 Chinese memorial tablet plate purchased from San Gabriel, California. These were displayed at Chinese funerals in China and buried with the deceased. 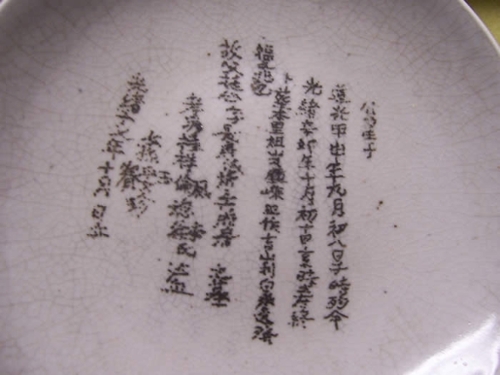 Chinese memorial tablet plate from the Asian American Comparative Collection, University of Idaho. Donated by Gary Weisz. 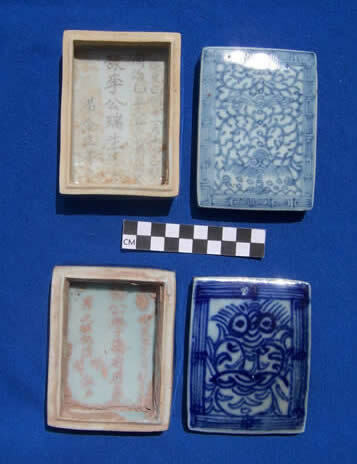 Semi-porcelain seal paste box memorial tablets purchased from California. 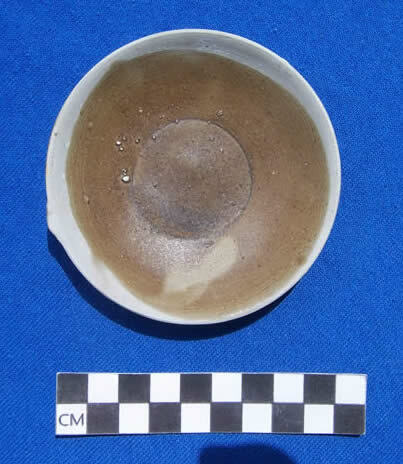 Chinese rush wick oil dish from the Tek Sing 1822 shipwreck. 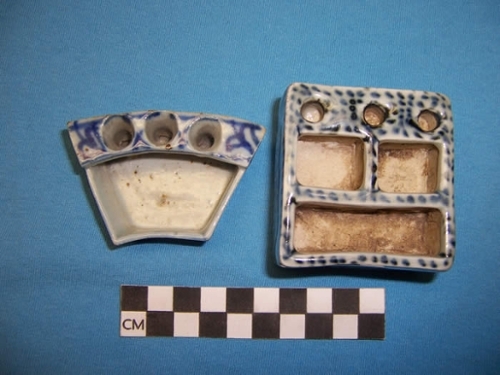 Chinese oil lamps remained basically the same from at least this point to the early 20th century, purchased from England. 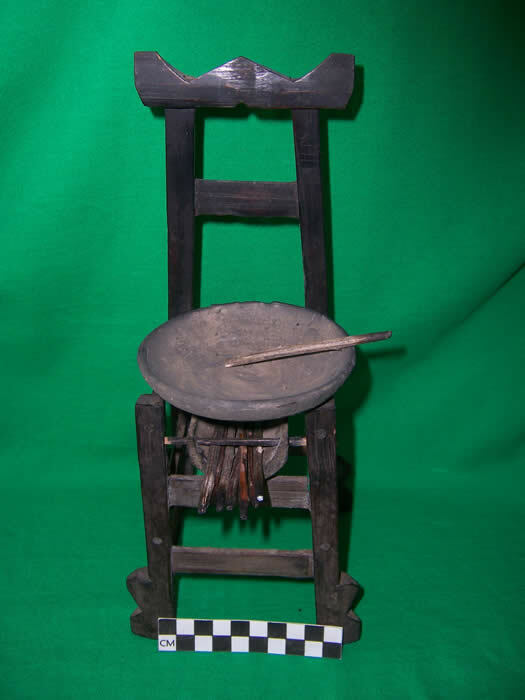 Chinese split bamboo rush wick oil lamp stand with oil dish purchased from Oregon. 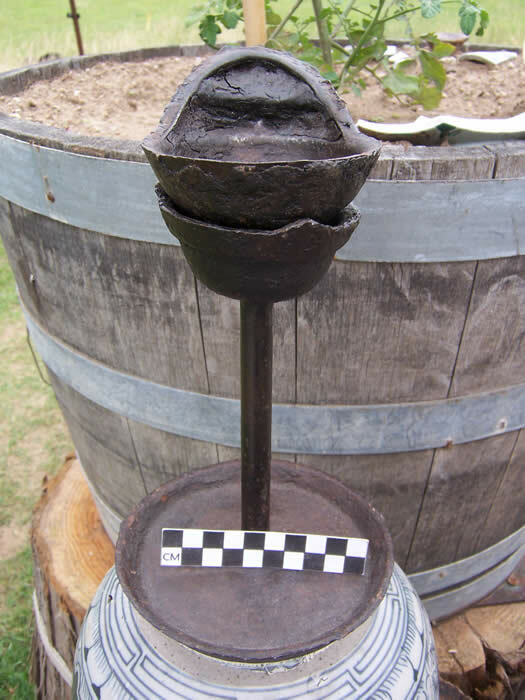 Chinese iron oil lamp purchased from Connecticut. This style of lamp is called a Po Po lamp (grandmother lamp). Chinese rush wick oil lamp with three mice on rim, with oil lamp resting on mice's noses. Lamp from China and dish from San Gabriel, California. 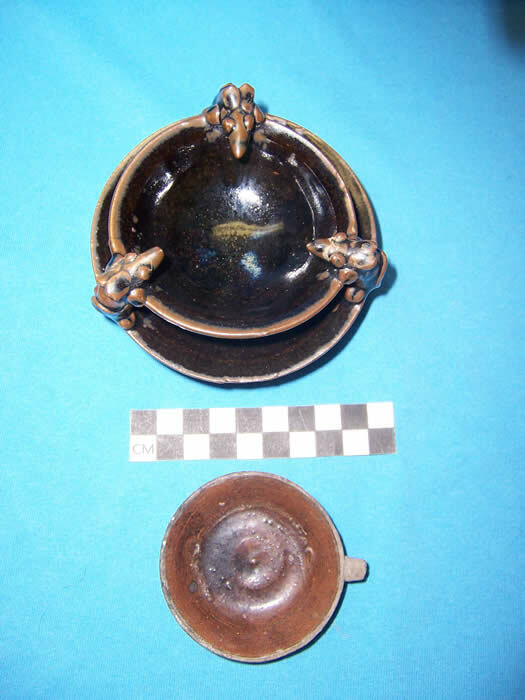 Chinese oil lamp dish, purchased from Virginia. 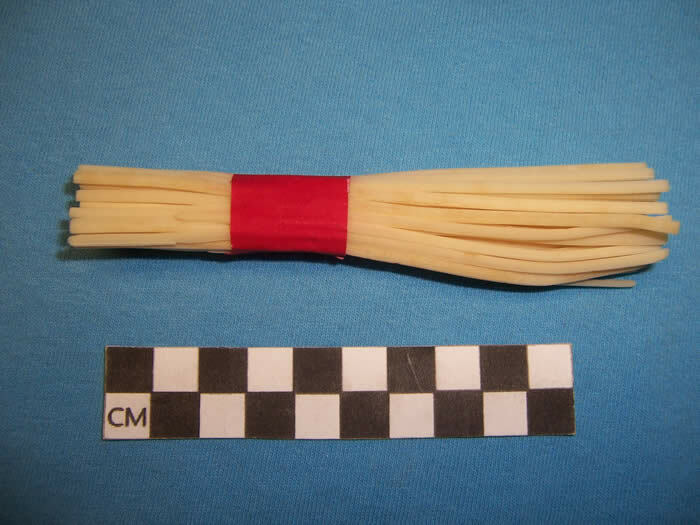 Chinese traditional rush wicks for oil lamps, from Guangzhou, China. 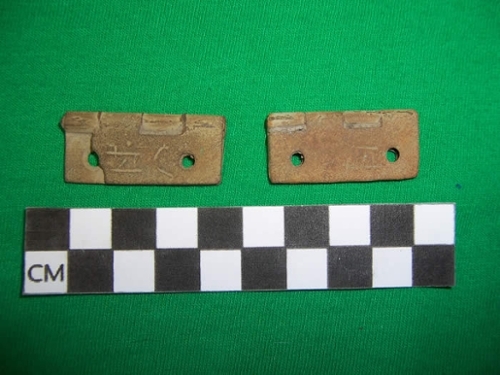 Two brass box hinges displaying Chinese characters found on archaeological sites in Idaho. 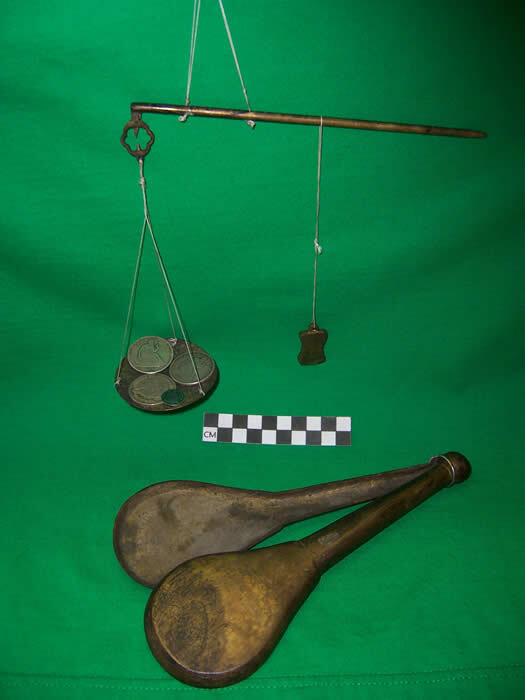 Paktong (nickel/silver alloy) table fork used to spear food from serving bowls or dishes. 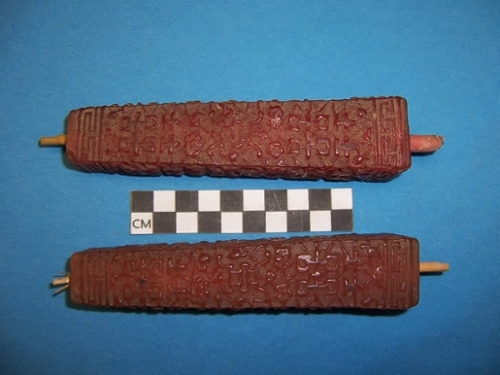 A similar item was excavated from Union Station excavations in Los Angeles. 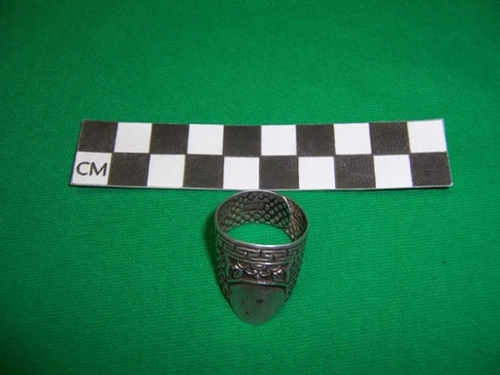 Silver Chinese thimble purchased from Beijing, China. 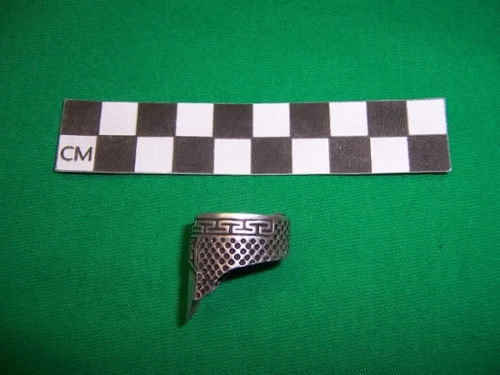 Paktong (nickel/silver) Chinese thimble from Brugge, Belgium. Brass shoehorns purchased from Tianjin, China. 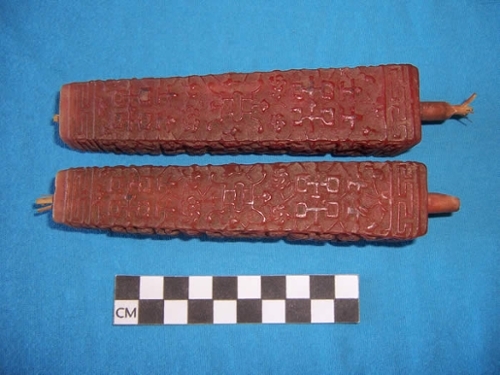 Chinese stone seals with box, purchased from Beijing, China. 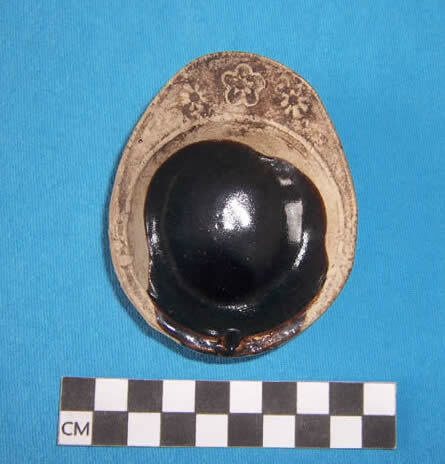 Chinese wood seal with bell design at top, purchased from China. The name reads Gold Bell Shop. Chinese calligraphy brush holders and washers. Left from Naugatuck, Connecticut, and Right from Beijing China. Chinese calligraphy water dropper used for mixing ink, from Beijing, China. 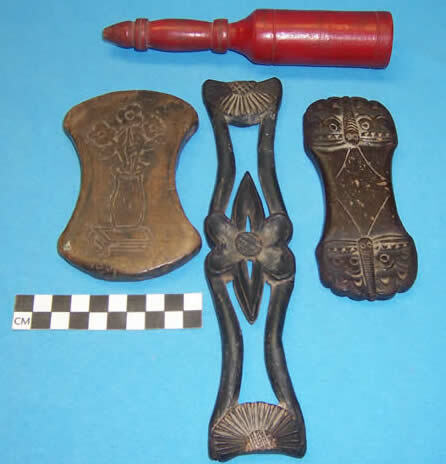 Molded Chinese candles with "Double Happiness" design. Note that both candles have the traditional hollow reed wicks. 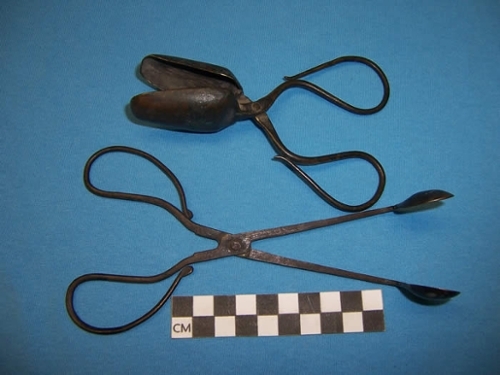 Chinese brass candle snuffers from Beijing, China. 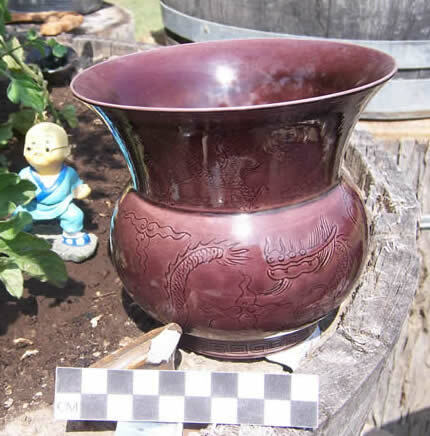 Chinese stoneware spittoon with dragon motif purchased from Shanghai, China. 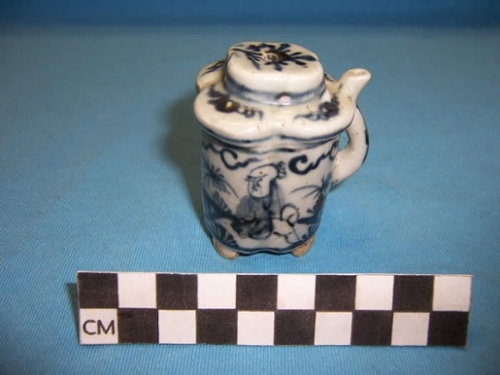 A spittoon was commonly used by opium smokers. 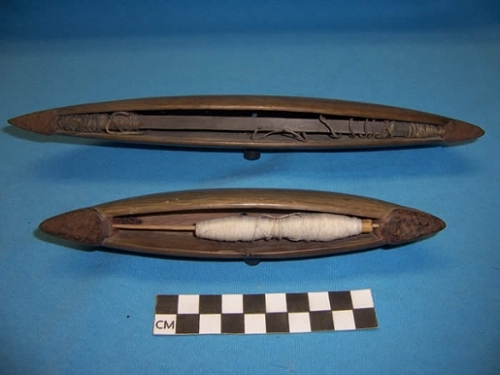 Wood shuttles with bobbins, for Chinese hand-weaving looms. Top from Beijing, China and Bottom from Nanyang, China. Wood thread winding boards and a red thread spool purchased from Beijing, China. 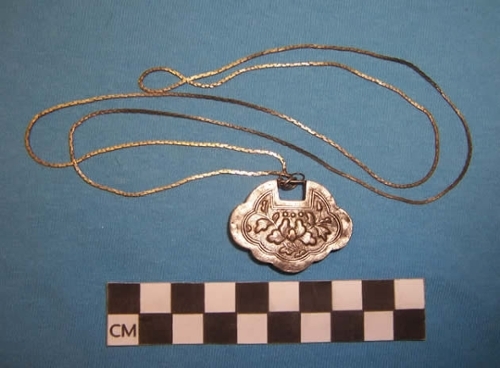 Chinese baby's longevity lock necklace for "Long Life" and "All Ones Life Safety", from Beijing, China, similar example in the Asian American Comparative Collection.